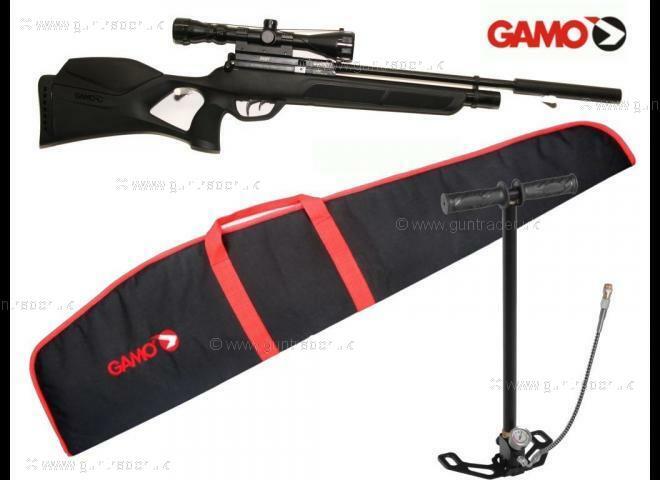 Gamo .22 Phox Package Pre-charged Pneumatic New Air Rifle for sale. Buy for £499. Offering the new shooter a practical and value for money rifle package, Gamo have redesigned the Phox package and now offer it in .177 & .22. The new and improved Phox packages have the Gamo Phox air rifle as a starting point and come complete with a Gamo 3-9x40 scope, 10 round magazine, Gun Bag, Gamo Stirrup pump and a removable silencer. Ideal for anyone looking for a value for money package, all you need to do is add pellets.Try before you buy at our premises on our purpose built range.